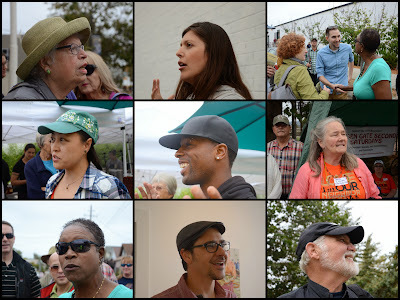 Saturday was an amazing Oakland Urban Paths walk through the Golden Gate district in North Oakland. It was also Love Our Neighborhood Day, with streets closed to vehicle traffic and opened to pedestrians and bikes, so in addition to the 70 or so people and 7 dogs who joined us for the walk, there were hundreds of people walking, biking, scootering, and skating in the streets. The walk was organized by artist and cultural historian Sue Mark, who is working on a project called Finding Klinkner. She and her husband Bruce are probably better known as the creators of the 10,000 Steps Project in downtown Oakland, which placed dozens of sidewalk markers telling the stories of Oakland's parks and people in downtown. We started the walk at the Golden Gate branch library, where we heard from Ruby Bernstein, Oakland Library Commissioner, about the library, its history, and the programs it provides. We headed up San Pablo (and enjoyed the use of the street!) to 59th Street, where Sue Mark told us about Charles Klinkner and Klinknerville, the name of the Golden Gate district for a time. She spoke near the Gateway Market, former site of Klinkner Hall. A short distance away, we passed the de Rome House, the family home of Louis de Rome. The de Rome foundry cast the firehouse bell that is in front of the library, as well as the large elk statue in the Elk's Club plot in Mountain View Cemetery. We also passed the 59th Street Firehouse, a historic firehouse that was converted into condominiums in the mid-1990s. Then it was over to the Destiny Arts Center where Beatriz Chavez told us about the youth and adult programs there. We took a brief tour through the space, which is entirely lit with natural lighting. Just outside Destiny Arts is the North Oakland Farmers Market run by Phat Beets Produce. Several speakers including Susan Park and Toveo Hill told us about Phat Beets' mission to bring affordable access to fresh produce to North Oakland, facilitate youth leadership in health and nutrition education, and connect small farmers to urban communities. Further wandering (and one wrong turn by me!) led us past countless Victorians and other homes to the Golden Gate Recreation Center. It's home to several colorful murals, and provides various programs to the community in addition to the basketball court and baseball diamond. The building is apparently due for some retrofit work. Back out on San Pablo Avenue, we heard from long-time resident and SPAGGIA (San Pablo Avenue Golden Gate Improvement Association) organizer Laura Ingram. She told us about some of the changes in the neighborhood over the years, early voter registration efforts in the neighborhood, and the formation of SPAGGIA. Up San Pablo a ways took us past various Love Our Neighborhood activities to St. Columba Church, where for many years the congregation has remembered victims of violence in Oakland with a white cross with each individual's name on it. St. Columba is across the street from Actual Cafe and Victory Burger, two local restaurants owned by neighborhood supporter (and one of the organizers of Love Our Neighborhood Day), Sal Bednarz. We'd seen him earlier on our walk, pedaling away on a bike-powered generator. Winding around behind St. Columba, past A Place for Sustainable Living, and the headquarters of local non-profits Grid Alternatives and Rebuilding Together Oakland got us to a quieter spot where we heard from Joanne Dickerson Harper, who was born and raised in the neighborhood. She told us about growing up in the neighborhood, St. Columba Church and what its long-time involvement in the neighborhood, and the changes she's seen over her lifetime in the neighborhood. We were running a bit late, so we skipped going past the Fratellanza Club, a long-time Italian-American social club. Heading west brought us quickly into Emeryville, where we strolled along past more Love Our Neighborhood Day activities. Our last stop was back in Oakland, at the Stanford Avenue Native Garden. There, environmental educator and semi-retired Merritt College professor Robin Freeman told us about what the area might have looked like before the Spanish came, as well as other bits of area history. Robin and his wife very kindly hosted us for water and watermelon in their backyard. Some people headed back to our starting point at the library, while others went to check out more of Love Our Neighborhood Day and get some lunch. Many thanks to all the speakers, and thanks for your patience with the lack of a sound system and the difficulties of shepherding such a large group. It was great to have many of the streets closed down so we could walk where we wanted. But we don't usually get that on Oakland Urban Paths walks, which occur the 2nd Saturday of every month, in various locations around Oakland. Check the calendar for the date and location of upcoming walks.